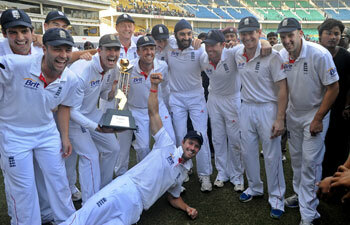 It took England 28 years to win a test series in India under the captaincy of Alistair Cook. The visitors did that convincingly winning 2-1, with the final test ending in a draw. The brilliant batting display from Jonathan Trott and Ian Bell ensured that the visitors do not lose any more wickets and the match ends in a draw. Both had a stand of 208 runs with both scoring centuries. The first innings score of both the teams was almost even. In the second innings, England lost her 3 wickets early on in the final day of the test. Then there was a brilliant partnership featuring Jonathan Trott and Ian Bell which saved the day for the visitors. Trott scored his eighth century and first in nine month. He was however, supporting the team by chipping in precious runs in almost all the tests. For Bell, it was his first test hundred in India and had to wait more than a year for that.